With more states legalizing marijuana for medical and recreational use, marijuana media is growing like a weed, including an array of new online publications, social networks, and podcasts targeting consumers and business people. Several stations around the country have flipped to a new format: marijuana talk. 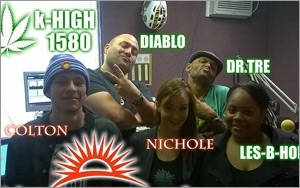 This week, Colorado Springs AM station 1580 dropped its old format, KREL/Fox Sports, and unveiled its new identity as KHIG/K-High 1580, devoted to all things marijuana-related. The new station’s weekday lineup includes “Wake and Bake,” a morning show, “High Noon” for midday, and “High Drive” for the evening commute. It will also carry hourlong newscasts from the National Marijuana News Service, a syndicated content provider based in Los Angeles. This is the second broadcast affiliate for The National Marijuana News, which scored its first affiliate In January with the announcement that WXXM (92.1 FM The Mic), a “progressive” broadcaster serving the Madison, Wisconsin area, will begin carrying the show. Previously, TNMNews, produced by DigiPath, Inc., was only available via online streaming. According to its producers, TNMNews covers a range of topics, including marijuana’s scientific, medicinal, political, commercial, legal, spiritual and cultural dimensions. 1 comment about "Pot Talk: Radio Stations Adopting Marijuana Formats". Robin Solis from synchronicity.co, April 17, 2015 at 2:26 p.m.